With never a mention of dirt track racing or Speedway as it is most commonly known, in Irish newspapers in this day and age, it would be hard for our younger generation to believe that watching motor cycle speedway was once a very popular social activity in Dublin in the late forties and fifties. Shelbourne Park Greyhound Stadium was one of the more popular venues for that sport and crowds of some 20,000 people would pack into that stadium every Sunday afternoon to watch their team "Shelbourne Tigers" take on and more often than not, beat the best teams that British Clubs could muster. During the 1950 season, British Clubs were queuing up to be the next team to cross the Irish Sea to take on the Shelbourne Tigers with a view to being the first to tame the Tigers. The other two tracks at that time were Santry and Chapelizod and they also enjoyed great turnouts for their Wednesday and Friday night race meetings. Ronnie Moore a 17 year old Australian was the boy wonder and hero of the fans that flocked to Shelbourne Park on those Sunday afternoons of times past, while Mike Tams led the Santry Saints to many a victory in Santry Stadium and fans at Chapelizod cheered on the "The Lizods", who later had a name change to the "Dublin Eagles" and later again the "Dublin Falcons". Not many would believe that motor cycle speedway once rivalled soccer as a spectator sport and for a while was akin to 'going to the pictures'. It is a claim of many, that Speedway was invented in a New South Wales Town called Maitland in 1923 where hundreds of spectators turned up at the local sports ground to watch a motor cycle race take place on an oval grass trotting track, however yours truly, through extensive research, found that a similar motor cycle race took place in Ashtown, Dublin, on an oval cinder trotting track in 1902 which also drew large crowds of spectators, which race was more likened to a dirt track race that the aforementioned grass track race. In memory of those happy times, I have recorded most all of the meetings that took place at those venues, the riders that took part and the results of same, together with a little of Speedways history and a mention of one or two well known people associated with the sport in one form or another. I also put my native Dublin on record as being very much a part of the evolution of Motor Cycle Speedway by staging one of the worlds first Motor Cycle Race Meetings on an oval cinder track in 1902. 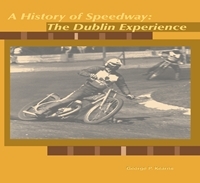 This book is also the first ever to record the history of Dublin's Speedway years and same will be launched in the Pearse St library on April 9th 2009 and will be available in the better Dublin bookstores on that date. 20 Euros + P&P 5 Euros.